Gorgeously ethereal, minimalistic and adored worldwide, the magical soundworld of the Icelandic band Sigur Rós has enraptured a worldwide audience with its quiet beauty. 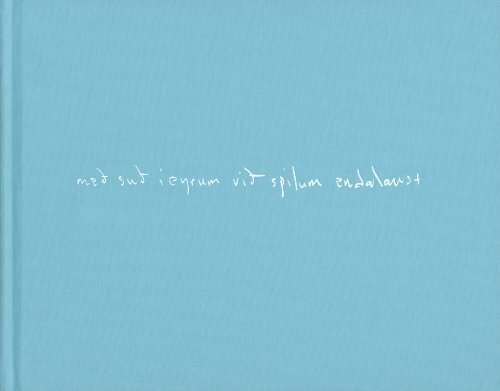 "Med sud í eyrum vid spilum endalaust" is a deluxe clothbound companion to the quartet's fifth album of the same name. It documents the creation of this album-whose title translates loosely as "with a buzz in our ears we play endlessly"-through Eva Vermandel's photographs and Nicholas Abrahams' two DVD films of the band: one a feature-length portrait of the complete recording of the song "ára bátur" at Abbey Road with full choir and orchestra; the other a 35-minute Super-8 film poem of the band touring and traveling in Iceland, Mexico and America, which includes the filming of the famous "Gobbledigook" video (made in collaboration with Ryan McGinley), tour rehearsals, the early shows on the tour and exclusive band interviews. Each edition is individually numbered and includes a unique strip of 16mm film taken from the "Gobbledigook" video.